Australia is an amazing, vast country. Although many of us tend to cluster to the urban mainland coast, we can often forget about regional Australia with its rolling hills, quieter beaches, winding rivers or red earth. It's in these beautiful places you also find some of the best food, and it's no surprise -- food growers and artisans in these areas supply us with some of the best produce in the world. 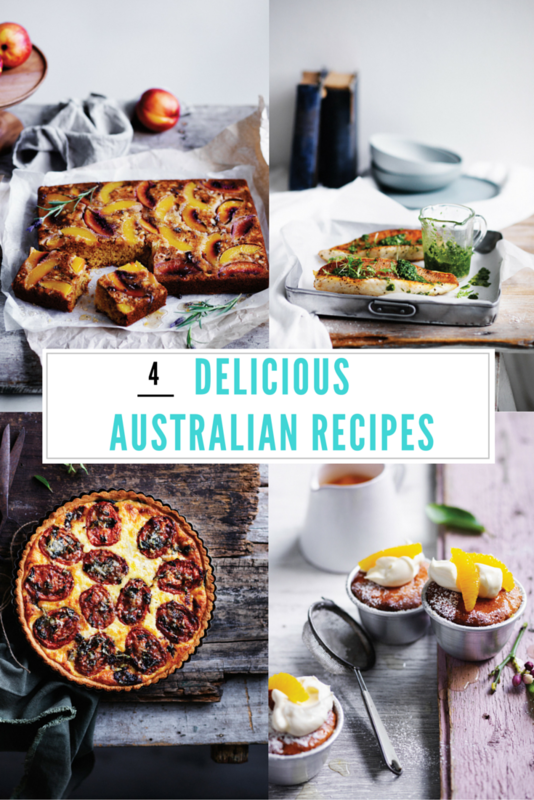 These sweet and savoury recipes from Australia Cooks showcase these fresh ingredients, with locals sharing their best-kept cooking secrets and favourite seasonal produce. 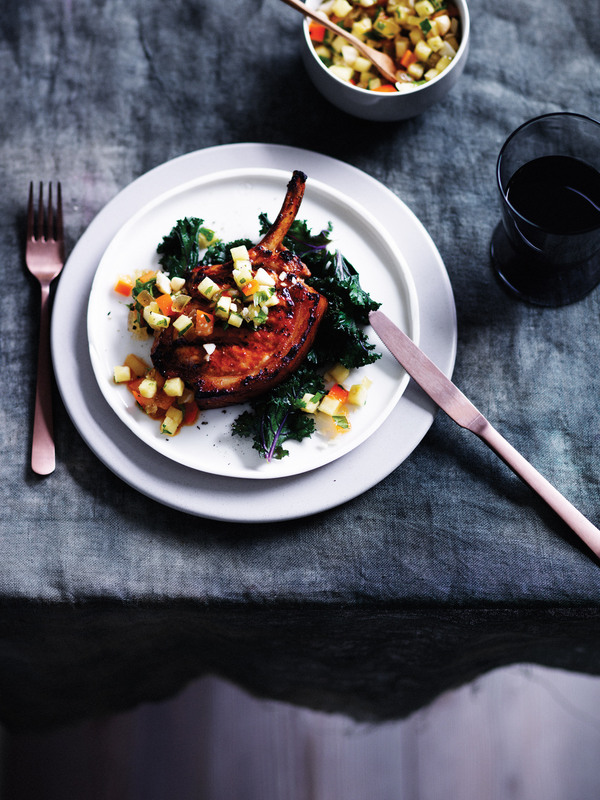 From Bega Valley to Armidale, these recipes are Australian food at its very best. By Wendy Goodisson from Stony Creek, New South Wales. "The Bega Valley on the New South Wales far south coast has been known for its dairy products for over a century. 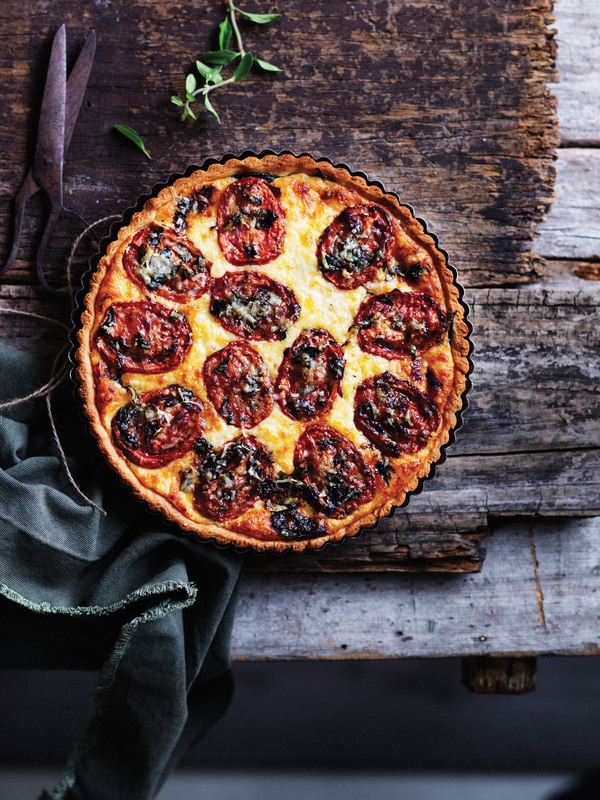 To give homage to these products -- including Tilba milk, cream and parmesan, and Bega butter and tasty cheese -- I have put together a recipe for a cheese tart that combines these products with the organic tomatoes and herbs grown in the Bega Valley region. Eat this great tart hot or cold for brunch. It also freezes well," Goodisson said. 1. To make the pastry, microwave the milk and butter in a heatproof plastic bowl on high for one minute, or until the butter has melted. Add the flour and mix until the dough forms a ball. Knead the dough on a floured bench top. Wrap the dough in plastic wrap and refrigerate for 30 minutes. 2. Preheat the oven to 160°C. Lightly grease a 24cm tart tin. Roll out the pastry between two sheets of baking paper until it is large enough to fit the size of your tin. Line the pastry with baking paper and weigh down with baking weights or uncooked rice, and blind bake in the oven for 15 minutes. Remove the baking weights and return to the oven to bake for a further 10 minutes, or until golden. Set aside. 3. Increase the oven temperature to 180°C. Line a baking tray with baking paper. 4. Place the tomatoes on the baking tray. Drizzle with oil and scatter over the chopped herbs. Top with the parmesan, and season with sea salt and a few grinds of black pepper. Cook in the oven for 10 minutes, or until brown on top. Set aside to cool, and reduce the oven to 170°C. 5. To make the cheese filling, combine the cream or mascarpone cheese, egg yolk, parmesan and tasty cheese in a medium bowl. 6. Line the pastry shell with a layer of fresh basil leaves. Spoon the cheese mixture on top and arrange the tomato halves on top of the cheese mixture. Sprinkle with a little extra grated parmesan and cook for 35 minutes, or until the cheese mixture is firm when tested with a skewer. 7. Allow to cool slightly before cutting. By Christine Buckley and Malcolm Oakley from Amamoor, Queensland. "The Mary Valley is in both the Gympie and Sunshine Coast council regions. All the main ingredients in our recipe are grown in the Mary Valley except for the pork, which is sourced from Rhodavale in Lower Wonga, just north of Gympie," Buckley and Oakley said. 1. To make the marinade, combine all of the ingredients in a bowl. Smother the pork cutlets with the marinade and leave in the fridge for at least two hours and longer if possible. 2. Preheat the barbecue to medium heat. Cook the pork for 6-7 minutes each side, making sure the meat seals without burning. Set aside on a warm plate covered with foil to rest. 3. Meanwhile, lightly sauté the pre-steamed kale on the barbecue hotplate or in a separate pan over medium heat for two minutes. Set aside. 4. To make the salsa, combine the pineapple, persimmon, ginger and macadamia nuts in a medium bowl. Add the macadamia oil and lime juice and stir to combine. Toss through the coriander and mint just before serving. 5. Serve each cutlet on a bed of kale with a generous spoonful of salsa. Serve the remaining salsa on the side. By Carole DeMaria from Buronga, New South Wales. "This dish represents the Sunraysia region of north-western Victoria and south-western New South Wales -- the land of sunshine, oranges, grapes and almonds. It features local Valencia oranges and almonds, and is finished with beautiful glistening glacé orange segments to depict sun rays. And you can substitute the Valencias for navel oranges when they're in season," DeMaria said. 1. Preheat the oven to 150°C. Grease four 125ml dariole moulds. 2. Beat the egg whites until stiff peaks form. Set aside. 3. Using electric beaters or an electric mixer, cream the butter and half the sugar. Beat in the egg yolks. Stir in the flour, almond meal, flaked almonds, and orange juice and zest until combined. Gently fold the egg whites into the mixture. 4. Divide the mixture evenly between the moulds. Place in a large baking dish and fill halfway up the side of the moulds with boiling water. Place the tray in the oven and cook the puddings for 30-40 minutes, or until a skewer inserted into the middle comes out clean. 5. Meanwhile, peel and segment the two extra oranges. Combine the remaining sugar in a small saucepan with two tablespoons water. Heat over medium heat, stirring, until the sugar is dissolved and the mixture comes to the boil. Add the orange segments, reduce the heat to low and leave to simmer for 2-3 minutes, or until the orange segments appear translucent. Set aside on a tray lined with baking paper. 6. Beat the cream until stiff peaks form. Fold in the mascarpone. 7. 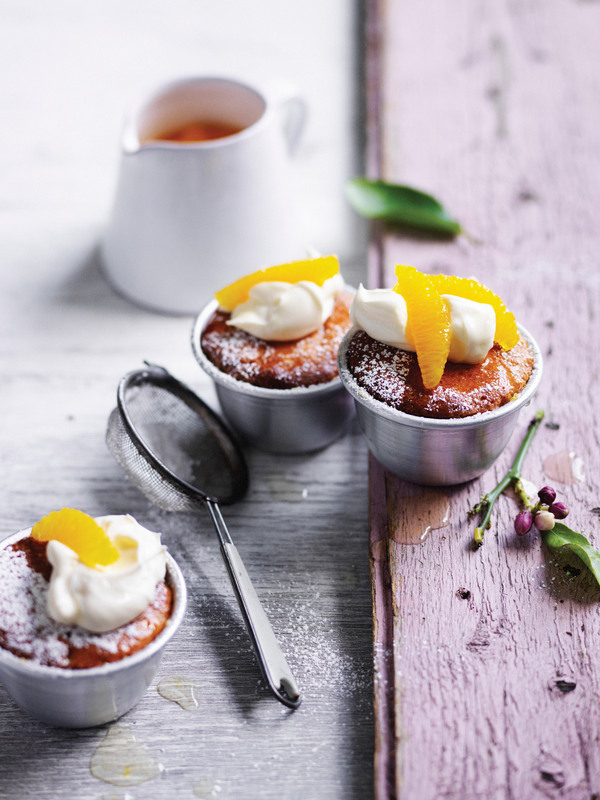 Dust the puddings with icing sugar and serve with a scoop of mascarpone cream on top, and orange segments fanned out to look like sun rays. By Lissa Villeneuve from Hobart, Tasmania. "Tasmania is an amazingly bountiful place to live. This recipe uses nearly 100 percent Tasmanian ingredients, with fruit and honey from my urban garden. You can substitute any seasonal fruit and it is truly delicious," Villeneuve said. 1. To make the lavender honey syrup, combine the honey, lavender flowers and two cups water in a medium saucepan over medium heat. Bring to the boil and gently simmer for at least 20 minutes. 2. Preheat the oven to 170°C. Grease a 20cm x 5cm round or 28cm x 18 cm x 5 cm rectangular baking tin and dust with finely crushed hazelnuts. 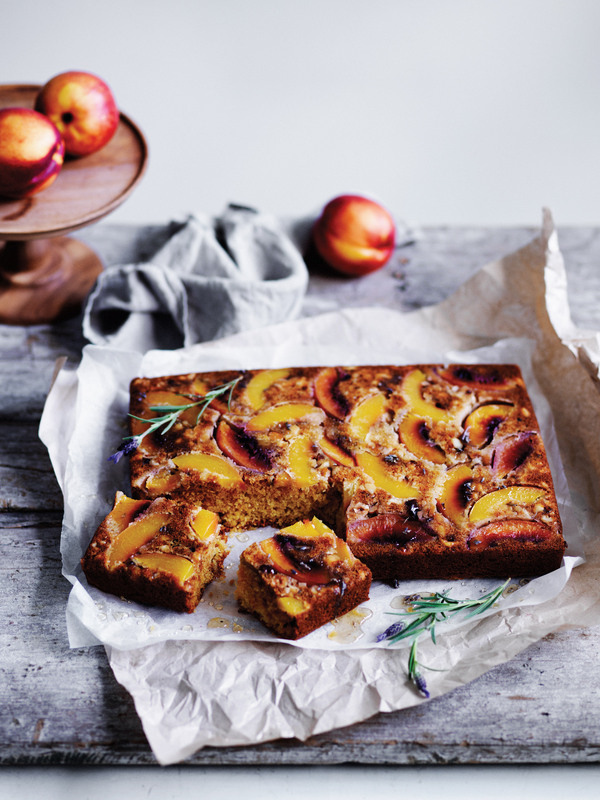 Arrange the nectarine slices over the base. 3. Using an electric mixer or electric beaters, beat the butter and lavender honey syrup until well combined. Add the eggs one at a time, beating well after each addition. 4. Combine the flour, baking powder and bicarbonate of soda in a bowl. Stir into the butter mixture. Add the lemon zest and semolina. Stir to combine. 5. Pour the cake batter over the fruit in the tin. Bake for 30-40 minutes, or until a skewer inserted in the centre of the cake comes out clean. 6. Prick the surface of the warm cake with a fork and pour the extra lavender honey syrup on top. Slice and enjoy. 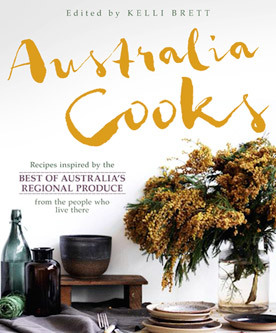 Recipes and images from 'Australia Cooks', edited by Kelli Brett and published by ABC Books.